PUT SCOUT VISION® TO WORK FOR YOUR FIRM. Scout Vision® Enterprise is a timely, accurate, high-spatial resolution tool for predicting home values and appreciation rates across all U.S. markets. Use the form below to request a data sample of up to 10 addresses and discover what Scout Vision Enterprise can do for your firm. Take advantage of Scout Vision’s forecasting capabilities through a NeighborhoodScout Pro Subscription. 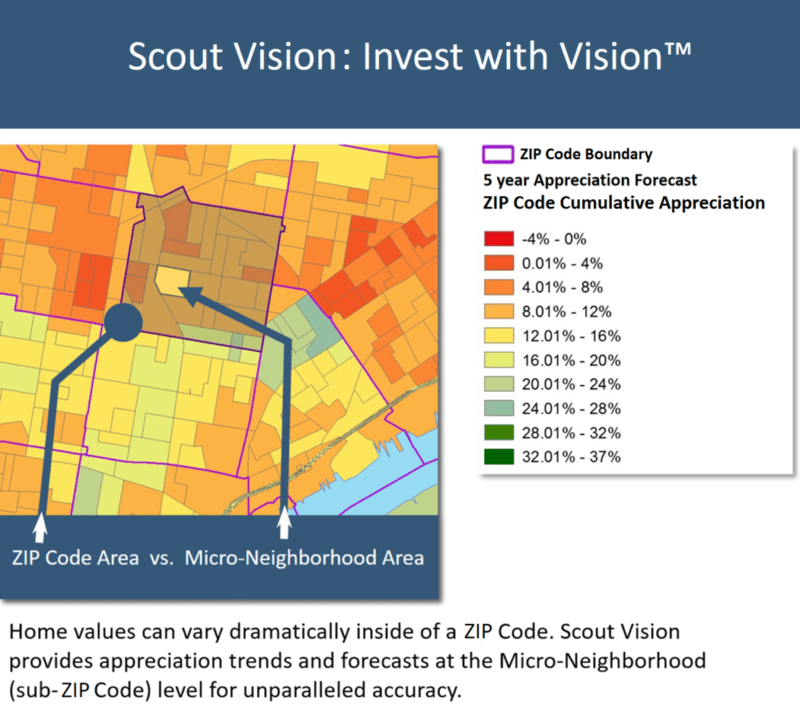 Location, Inc.’s Scout Vision: Predictive Neighborhood Home Values and Appreciation Rates for the Future 3-5 Years. Whether you are investing in real estate, providing a bridge load for a construction project, or purchasing mortgage-backed securities, Scout Vision is the most timely, accurate, hi-spatial resolution tool for predicting appreciation across all U.S. markets. NeighborhoodScout's enterprise data get to the heart of a neighborhood’s true personality, or DNA. These insights are normally only discernable after the fact—after locating your firm to the neighborhood or personally living there for some time. Want the most comprehensive real estate analytics? NeighborhoodScout entprise data provide valuable business insight for real estate investment, including the only seamless national dataset of neighborhood-specific home appreciation rates available today. Know the true personality of any U.S. neighborhood. NeighborhoodScout's enterprise data provide exclusive lifestyle, character, and living conditions of every neighborhood, accessible by street address. Only NeighborhoodScout enterprise data provide patented, nationally comparable school rankings based on test scores, so you can directly compare the quality of schools in any location. SecurityGauge leverages Location, Inc.'s CrimeRisk data in a comprehensive report format, featuring detailed heat maps for specific addresses. SecurityGauge crime analytics are used in insurance, retail, mortgage and real estate to provide insights into property and violent crime risk. Know violent crime and property crime risks for any U.S. address. CrimeRisk, part of RiskSuite™ by Location, Inc., is the industry standard for the most spatially accurate crime risk data available today. High-resolution FireRisk, part of RiskSuite™ for Insurance by Location, Inc., is available at the census block level, empowering personal and commercial lines insurers address one of the biggest challenges that they face today: Structure fire losses due to human behavior. Most homeowners insurance risk data focus on weather-related water damage from storm events and not what actually causes most water damage claims. WaterRisk, part of RiskSuite™ for Insurance by Location, Inc., fills this void, predicting previously unaccounted-for risk of insurance losses due non-weather-related water damage.